I wanted a place to store all my climbing guidebooks and maps, and I figured the small space above the side door was perfect. This was pretty simple to build however I did have to make sure I made it strong enough to hold 50 pounds of books. Since most of my books are 6 by 9 inches in size I made three spots exactly 9 inches wide each for guidebooks to be easily stacked and to avoid them from sliding all around while driving. At the end, this worked out perfectly. 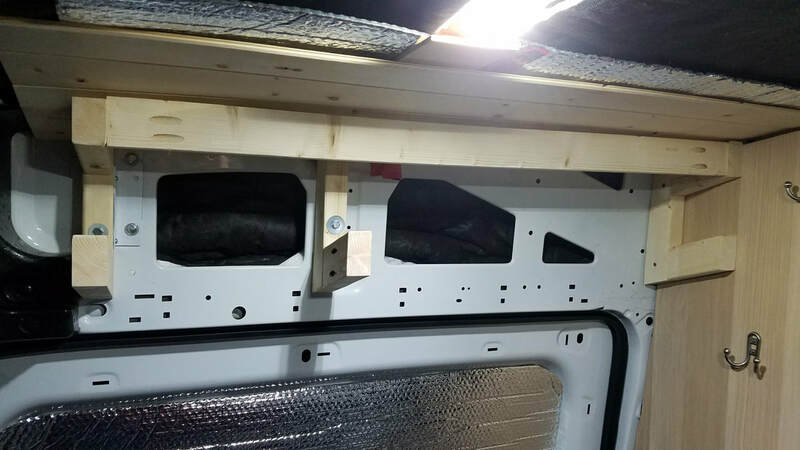 The frame for this small shelf would be pretty simple with just a few "U" shaped pieces secured to the inside van panel with 90 degree metal brackets. I had to use the table saw to rip the short pieces to match the odd angles of the upper side paneling above the sliding door. Also, since I wanted the actual shelf to be angled up a bit, I also had to cut the ends of each piece at different angles to make this possible. Once each piece fit in place, I used the Kreg hole jig and glue to join each piece together. Before I secured them to the van I started the ceiling in this section, since it would be inaccessible after this shelf is finished. 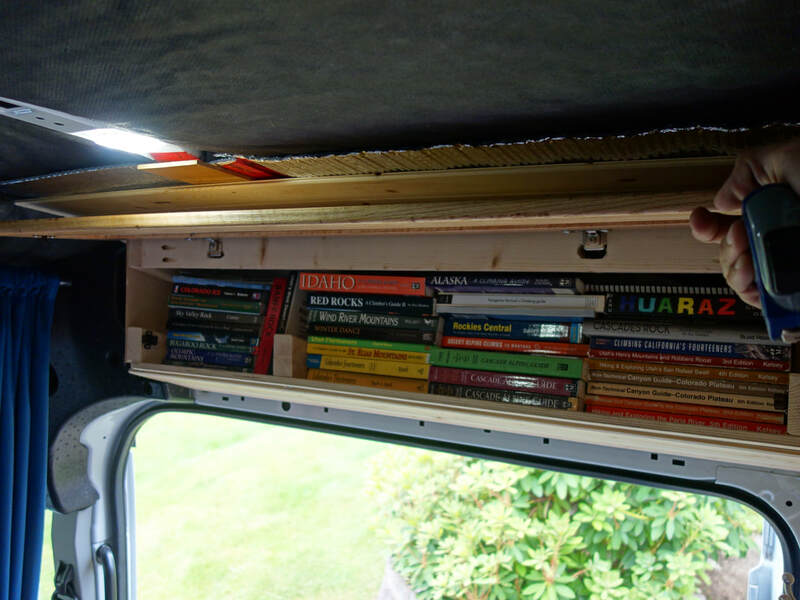 So I simply bolted a narrow strip of old plywood to one of the ceiling struts with a couple rivet nuts, then cut a few of the pine panel boards to stretch from the wardrobe to the edge of the passenger seat extending far enough inwards to clear the width of the bookshelf. 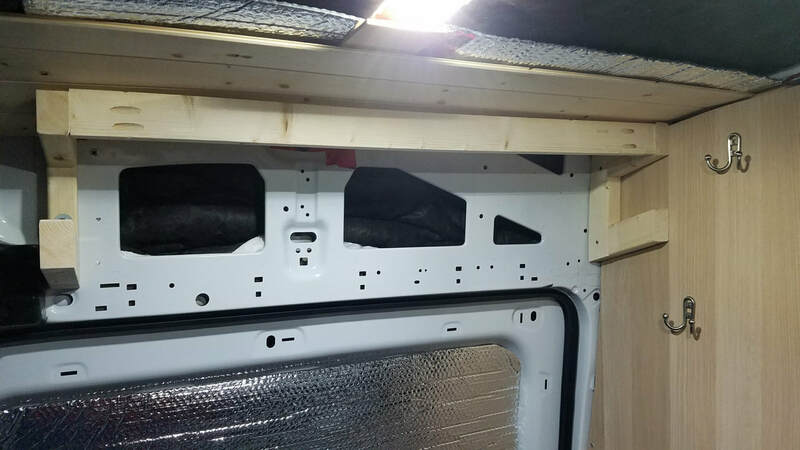 Once this part of the ceiling was complete, I secured the first "U" shaped frame piece by drilling directly through the piece that butts against the van and bolted it to a rivet nut (left side of photo). For the second frame piece I was able to screw it directly to the side of the wardrobe, and into the studs there (right side of photo). I then joined the two sides with a longer stud at the top that the hinge for the door would connect to. Notice the frame and how it's shaped. Door will open up on the longer piece across the top. Then I built the middle frame piece and placed it so there was 18 inches of space on the right side, and 9 inches on the left side. This would allow me to fit two columns of books on the right, and one on the left with minimal movement and sliding of the books. Note the books will be stacked on top of one another and not on end like a traditional bookshelf. I then used some scrap 1/2" birch plywood from the bed platform installation to form the bottom of the shelf, that the books would rest on, and secured it to the bottom of each frame piece with large screws. I then tested it for strength, placing 50 pounds of force on the shelf without much bending or flexing of the wood. Perfect! 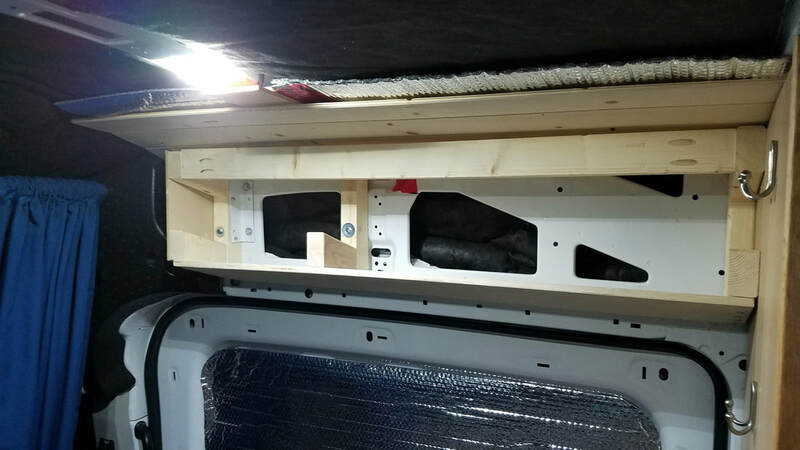 Middle frame piece installed. Also notice the white bracket on the left frame for extra strength. Added the bottom shelf and a small trapezoidal piece of 1/4" thick hardboard along the left end facing the windshield. This door I built the same way the wardrobe door was built, with a tongue and groove fit with 1" X 4" oak boards and the pine panel boards inset into dato grooves inside them. Again, I had to use the dato blade on the table saw to rip a 5/16" groove into the center of one of the edges of the 8' oak board, and slowly cut a tongue into each end of the two shorter pieces. 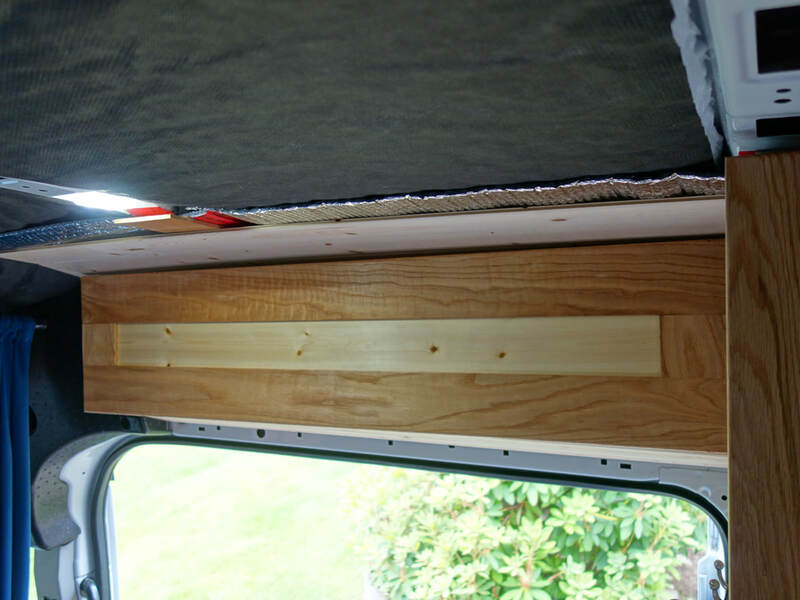 Once the fit was perfect, I cut one pine panel that would fit within the dato inside, and glued everything together. Lastly I stained the door with the oil based stain I have been using throughout the build, and used the router to cut the 1/2" deep circles on the backside of the door for the inlay hinges. I had to get creative cutting out a slot in the stud piece at the top to get the hinge to fit in the correct spot, then had to drill a hole below the slot so I could access the screw but it worked out. Door open...I'll add a gas strut to hold it open. Notice the slot in the stud where the hinges are inset. Door closed. I added some clips along the inside, and a latch along the bottom to hold the door closed.